I have made no secret of the fact that I am a hopeless Francophile. Though I have always loved all things French, my passion for the country and its culture truly started to blossom somewhere in my early-20s during a trip to the Alsace region. I was captivated by the landscape, the culture, the music (play me an old Aznavour record and all is good in the world again), and of course, the food and wine. Each subsequent trip saw me falling for the charms of France even more. So much so, that I’ve even devoted a large part of my career to declaring my love for the country — through words. I am a food, wine and travel journalist (with a background in Dutch language/culture and art history) who lives and works in the Netherlands, but I spend quite a bit of time traveling through France, both on holiday and for work. Being there is a huge source of inspiration, also in my day-to-day life. I am a cosmopolitan woman (born in Colombia, raised in the United States and Dutch since 1997), but in my heart I am a real Française. My love for France has influenced the way I eat, cook, drink, think, sing and even decorate my home. Just ask my husband, who jokingly rolls his eyes every time I drag him to a vide-grenier! Besides being a magazine editor, I am also the culinary columnist for France magazine En Route (where I write about French food history) and a regular contributor to Living France and Bouillon. I am also a recipe developer and have created approximately 350 recipes for the Dutch women’s weekly Vriendin as well as recipes and food videos for the Belgian website Koken.be. You can also find some of my videos on my YouTube channel, La Douce Vie Food. 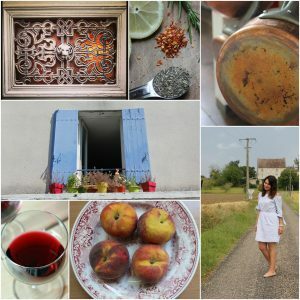 On this site I will be sharing my French lifestyle (eating well and living well!) and passion for France with you. From telling you about interesting places, recipes, products and people, to giving you tips on how to live your life with French style, flair and joie de vivre! Would you like to see samples of my food/recipe writing and styling? Have a look at my ‘The French Life Cookalong’ booklets (cookalong v2 (1) (1)) & Cookalong 2. The design is the work of my husband, Hans Westbeek.